The problem with beers that have a huge cult following is that if you miss the chance to purchase them on the day they come out, you're basically stuck with drinking the thousands of other delicious craft beer bottles you can pick up at the liquor store with ease. But is that the type of life you want to lead?! Of course not. Only the best for you, which is why we'll tell you when you'll be able to procure some of the best, most sought-after beers in the country, including 3 Floyds Dark Lord, Founders KBS, and many more... plus a few whose very releases are cause for celebrations. Some of the dates aren't finalized, but we'll keep this calendar up to date as each release is locked down. Winston-Salem, North Carolina's Foothills Brewing knows how to throw a party for the yearly release of Sexual Chocolate, which is also the name of the medical condition for people aroused by Hershey's bars. This year, the festivities start on January 29th at 2am, when a line is allowed to form the second after the brewpub closes. Bottle sales start at 9am for those hearty souls willing to line up to get a wristband at 6:30am. And while the release party serves breakfast and kegs of the famed cocoa-infused imperial stout, the fact that there's an unofficial relaxed policy of drinking on the street by local law enforcement from 2am-6:30am while you wait to get a wristband will make the day that much more special. Pliny the Elder is a double IPA from the good folks at Santa Rosa's Russian River, and it's one of those beers you need to drink before you die. You can buy it in bottles at any decent booze shop. Pliny the Younger, however, has never been bottled. And in order to get a taste, both elderly and young people alike must get their asses to Russian River's tasting room from February 5th-18th (or find a rare tapping to attend elsewhere). Some people have waited eight hours for a 10oz pour of the 10.25% ABV triple IPA, but the brewery says it's made changes to reduce the time people will wait, including a time limit on how long you can sit in the brewpub quaffing as much as humanly possible. 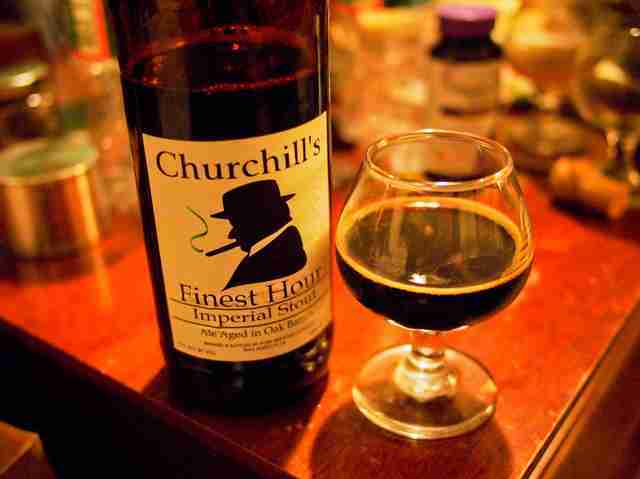 The release party for Churchill's Finest Hour, an imperial stout from Port Brewing Co., is the first Saturday of March every year. But it's not sold at the tasting room in San Marcos, CA. Rather, it's always released as part of Renaissance, a beery bash with a tap list that will make any beer nerd drool so much they become severely dehydrated (think Lost Abbey and Russian River rarities). That's why people line up at 2am. And if you aren't lucky enough to get a bottle on March 5th, you can at least drink the beer on tap if you attend the party. The best reason to move to Tampa, Cigar City used to have a huge party at its brewery to fête the release of the imperial stout Hunahpu... until people started counterfeiting tickets and it turned into a clusterf... shutyomouth. This year, the brewery changed the venue to Downtown Tampa's Cotanchobee Fort Brooke Park, and on March 12th people will be able to eat, drink, and score bottles in a much more organized fashion. Firestone Walker's beer calendar for 2016 has this year's release of Parabola hitting shelves around March/April, which makes sense, as last year it was March 21st. The Paso Robles brewery bottles 22oz bombers of this highly coveted, 14% Russian imperial stout, which previously was aged for a year in old Pappy, Buffalo Trace, and Four Roses barrels. Last year, the brewpub offered Parabola beer pairings with purchase of an entree + dessert, and if you attended specific tours of the brewery, barrel samples "straight from the source." 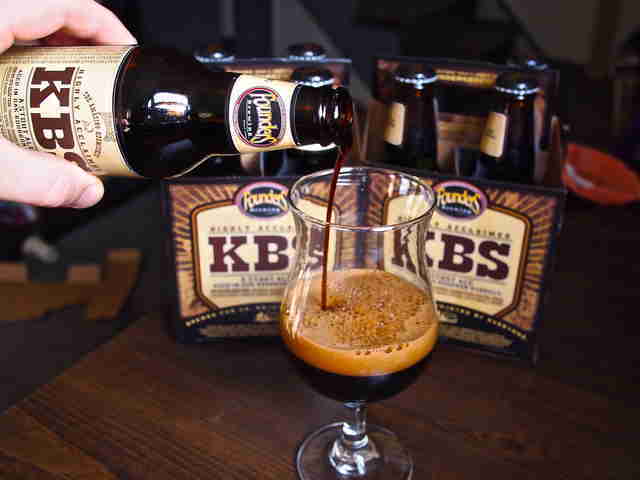 Weirdly, Grand Rapids, Michigan is the place to be to enjoy some of Kentucky's finest work, as Founders KBS is a beer "brewed with a massive amounts of coffee and chocolates" that gets aged in bourbon barrels. The brewery says it's "aged for a year in the caves beneath Grand Rapids," which means you might want to start spelunking now to score some before everyone else. But seriously, stealing is bad. Last March, the brewery had a week full of celebrations for the beer's release, which looks like fun even if you don't score a bottle. In a calendar full of Russian imperial stouts people lose their minds for, there is only one Dark Lord. And it is on Dark Lord Day, held the last Saturday of April each year, that Munster, Indiana hosts a huge blowout at 3 Floyds Brewing, with Dark Lord on tap, bands, food, and a ton of other beer to drink. You can't actually buy Dark Lord at the festival, but the brewery makes sure that if you have a group ticket (which went on sale on March 14th last year), you can buy an allotment of four bottles, which you can then trade for basically any other beer in the universe. The 13th best coffee beer in the country from San Diego, California's pride and joy, AleSmith Brewing, gets extra delicious when it's aged in bourbon barrels, which is likely why it sells like hotcakes via an online sale each year. Last year the tickets went on sale in July, but this year the brewery tells us it's planning on selling it sometime in August. Stay tuned. There are imperial stouts with enough chocolate and coffee in this article to keep your eyes as open as Alex's in A Clockwork Orange, but St. Louis, Missouri's Perennial decided to beef up its imperial stout with unconventional ingredients like ancho chili, vanilla, and cinnamon sticks. Last year, tickets went on sale online in mid-October for pickups in mid-November. $70 bought two bottles of plain ole regular Abraxas and one bottle of coffee Abraxas. In October 2015, Surly threw a huge party with rare beers, live music, and food trucks at its Brooklyn Center, Minnesota brewery to herald the release of its Darkness Russian imperial stout. It even upped the ante this past November with the release of a whiskey barrel-aged Darkness with a 12% ABV, which we hope is a trend. In fact, every brewery should just age every stout in whiskey barrels before releasing it. No one would complain. Despite the foreboding name of the beer, Placentia, CA is a happy place to be on the final Tuesday of every October, when The Bruery releases its bourbon barrel-aged imperial stout that routinely clocks in at 19%. The Bruery recommends you check its Facebook for when it goes on sale exactly, but if you're lucky enough to get your hands on a bottle, be sure to pair it with the foods the brewery recommends on its website: "braised Sasquatch short ribs, manna salad, golden ticket Wonkabars, and the end of days." Sure, you can get this Cleveland-born beer in six-packs and on draft in November fairly easily, but half the fun associated with drinking the 7.5% ABV beer with fresh honey, cinnamon, and ginger flavors is attending the First Pour party at the brewery. In 2015, the free party was held on a morning in late October, and featured beer floats, cinnamon-sugar barley pretzels, and Christmas Ale sausage. Oh, and scads of people lining up waiting to get in. The weekend Mother of All Storms, a big 14ish% ABV barleywine aged in bourbon barrels, was released at the end of November 2015, the Pacific City, Oregon brewery's brewpub offered a breakfast buffet with beer pairings and a four-course brewers dinner. Last year it even had some previous year's Mother vintages for sale, if you happened to be living in one of those Kimmy Schmidt-type bomb shelters for years and were unable to buy the beer previously. It says something to the power of this imperial stout that Goose Island can hold an event called Black Friday on Black Friday, and people show up in numbers that make you think they're waiting in line for a $2 TV at Walmart. 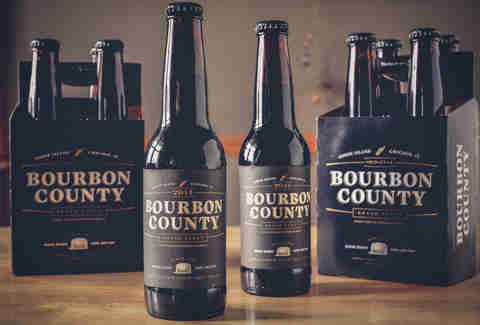 Every year, multiple varieties of BCBS are released -- this past year, a barleywine, a rye stout with blackberry juice and cocktail cherries, and an Intelligentsia coffee stout (aka the best coffee beer in the country) made the grade. Guys Drinking Beer did a great rundown of the festivities this past year, so keep your eyes glued to their site for an overview of everything happening in 2016. The Amherst brewery told us that its hugely popular 9.5% ABV imperial stout is usually released late fall/early winter, which is in line with the late-November release in 2015. Other varieties of the brewery's most popular beer include a barleywine, a cherry stout, and a Scotch ale... but those aren't the sought-after stout. So hold your horses and get ready for the real deal (probably by drinking those other ones). A 12.2% ABV imperial stout from the venerable Bend craft brewery, Abyss is typically released in November, but this past year, beer nerds were forced to wait until mid-December. Oh, the horror! 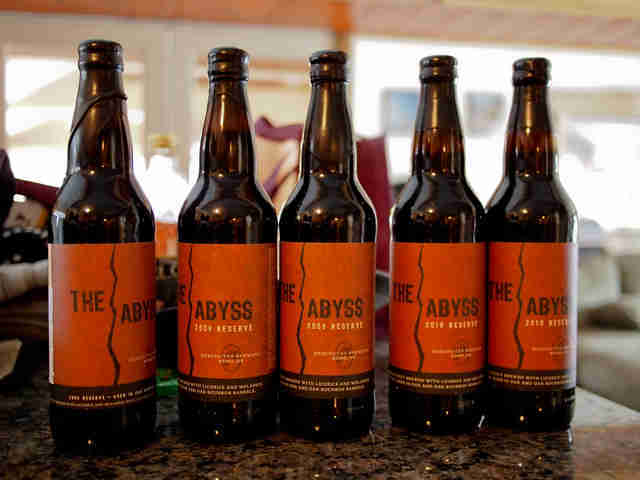 But their wait was rewarded with another surprise in January, as Deschutes dropped Cognac and rye barrel-aged Abyss bottles, along with paired dinners and flights of all Abyss varieties in the taproom. Lee Breslouer is a senior writer for Thrillist, and will trade you some Avery rarities for that Maine DIPA. Follow him to trades: @LeeBreslouer.